This bracelet is easy to make. 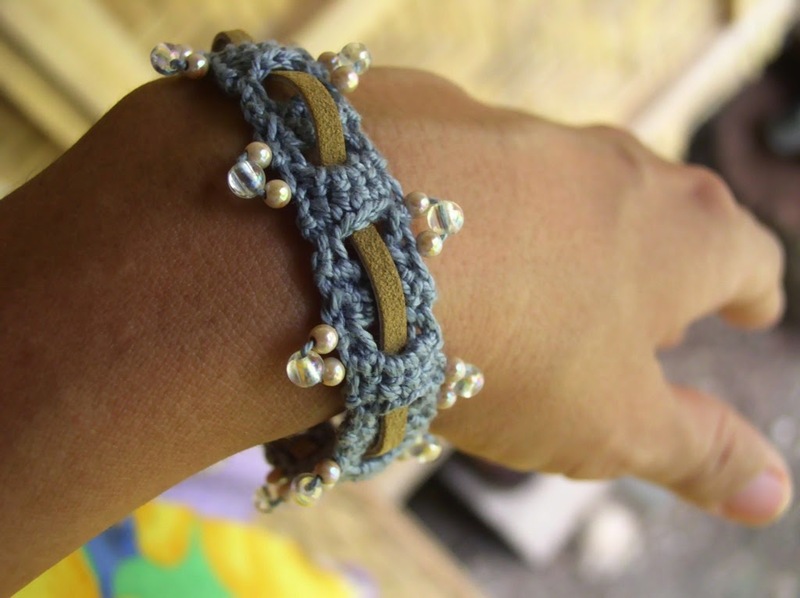 It is crocheted with beads then the leather strip is woven through the loops of the bracelet. 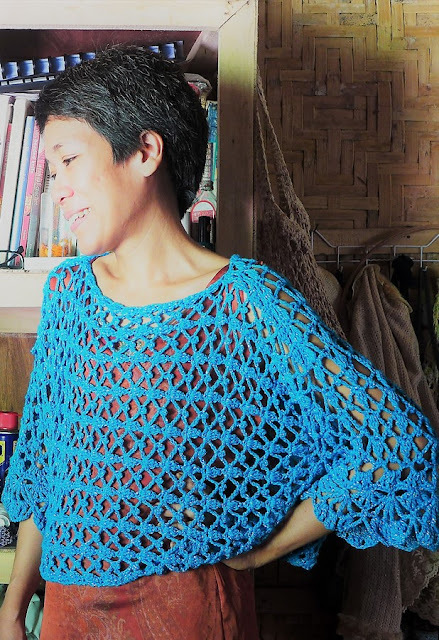 Use good crochet cotton thread and combine with beads of your choice. 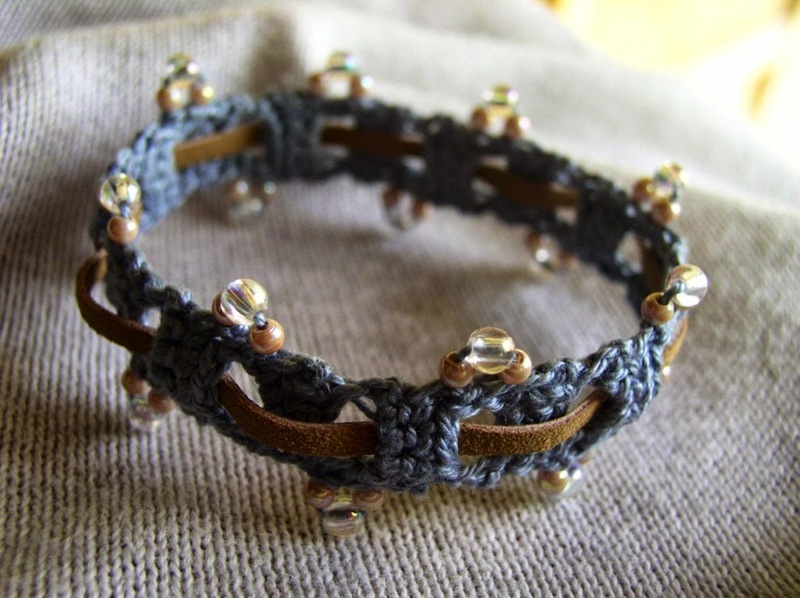 A strip of leather is woven through the bracelet but you may use other materials. The beads are strung onto the thread before crocheting. The beads are strung in the order (1 pearl bead, 1 glass bead, 1 pearl bead). Sixteen sets of beads of the sizes indicated make a bracelet approximately 7 inches in length, the average women’s size. Add or subtract bead sets to adjust the length of the bracelet but always work with an even number of bead sets. At the last row, the ends of the bracelet are joined together with sl st. The leather strip is woven through the spaces in the bracelet. Before crocheting, string the beads onto the thread in the order (1 pearl bead, 1 glass bead, 1 pearl bead). Row 1: Ch 6, sc in second ch fr hook and in each ch across (5 sc made), ch 1, slide beads, ch 1, turn. Row 2: Sc in first sc, ch 3, sk 3 sc, sc in last sc, ch 1, turn. Row 3: Sc in first sc, 3 sc in ch-3 sp, sc in last sc, ch 1, turn. Row 4: Sc in each of next 5 sc, ch 1, slide beads, ch 1, turn. Succeeding Rows: Rep rows 2-4 to about quarter inch shorter than desired length keeping an even number of bead sets. End rep with row 4. Next Rows: Rep rows 2-3. Last Row (This joins the ends of the bracelet together): Sl st in each of next 5 sc right through each st in row 1. Finish off. Weave the leather strip through the spaces in the bracelet. Sew the ends of the leather strip together. Trim excess leather strip. Weave in all ends.